With more than 4,500 employees working in 46 countries, Switzerland-based Leica Geosystems knows how important it is to have premium-quality videoconferencing equipment to enable successful collaboration and communication. 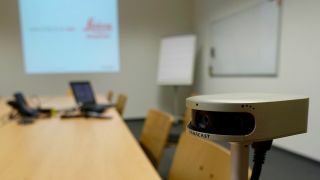 The surveying and geographical measurement company chose to upgrade its videoconferencing capabilities with a camera system that is designed to capture every inch of the room and every seat at the table: the 180-degree, 4K PanaCast 2 from Altia Systems. Leica Geosystems considered all the aspects that make videoconferencing efficient and effective—ease of use, video quality, ability to make adjustments, and cost—and determined the PanaCast 2 camera was the best solution, thanks to its wall-to-wall video coverage with Panoramic-4K quality and plug-and-play operation. The PanaCast 2 pocket-sized unit houses three angled cameras and stitches the video feeds together in real-time to offer an ultra-wide, 180-degree field of view in 4K resolution. Once the company began using PanaCast 2 cameras, their appetite for better remote collaboration grew, and they determined that they needed pan, tilt, and zoom (PTZ) functionality to allow focusing and close-ups of white boards, presentations, and individual speakers. They wanted viewers to be able to see details on presentations and read facial expressions as if they were in the room. Altia developed its PanaCast ePTZ app to allow users to digitally pan and zoom up to 4x within the 4K video stream. With this silent functionality, Leica Geosystems can “look around” the room and even create one-button presets that will automatically focus on specific seats or areas, such as a whiteboard. The plug-and-play design and operation means that PanaCast 2 units can be deployed quickly and easily across any size organization to immediately improve remote collaboration and simplify the technical needs of meetings. PanaCast 2 is compatible with leading collaboration software providers including Skype, GoToMeeting, Zoom, Webex, Slack, Google Hangouts, join.me, and more.